Growing up in a traditional Italian-American household, family values were instilled in me from an early age. There is nothing more important than la famiglia. I have a brother and a sister and we’ve always been close. We learned to look out for one another and to support each other under all circumstances. I can remember times when the three of us would conspire our next moves against our cousins—we vowed if we got caught we’d go down together. Or times when we would visit family in Italy—we’d go from house to house; each family wanted to feed us, but after three visits in a two hour span we were stuffed to the gills! In case you weren’t aware, Italian people can be very pushy especially when it comes to food—not wanting to be rude, we would take the cookies being forced our way, slip them into our pockets and dump them after we left. Oh, the good times we had! Not every family is perfect and there’s still a lot of hair pulling, but I wouldn’t trade my siblings for anything in this world. 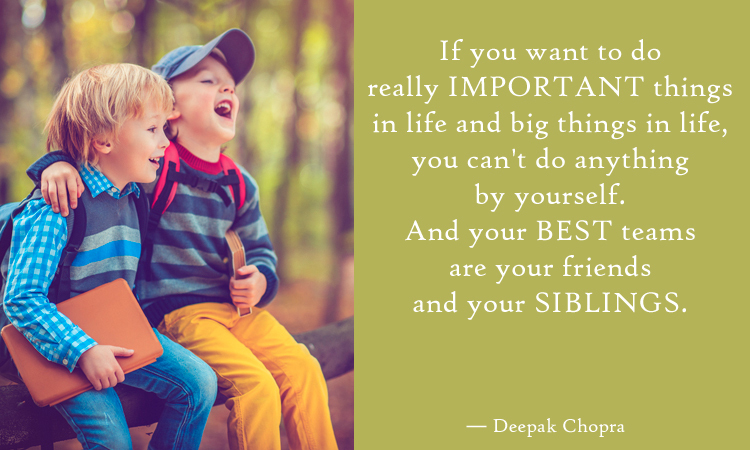 Today is National Siblings Day, a day dedicated to celebrating the importance of family, specifically the meaningful relationship between brothers and sisters. Claudia Evart – founder of the Siblings Day Foundation – created Siblings Day after losing both of her siblings, Alan and Lisette, early in life. Siblings Day is celebrated each year on April 10, Lisette’s birthday. How will you show your brothers or sisters that you care today? Share your stories in the comments below!